The end of the school year brings both celebrations and tears – sometimes in the same ceremony. As the end of May approached and the school year came to an end, the usual series of articles (HubPages, Washington Post) began popping up the US press complaining about “graduation” ceremonies. There are graduations from high school, of course, and from kindergarten, and now, if you believe the blogosphere, every grade has some kind of promotion ceremony. It goes along with the American tendency to celebrate every child and every minor accomplishment with the hopes of promoting self-esteem and giving each boy and girl the confidence to fulfill his or her potential. In Russia, where detailed explanations of the grades and behavior of each student in a class are up for discussion at class parents’ meetings and the ability of every child to determine his or her fate is far from established, graduation is celebrated three times – at the end of kindergarten, at the end of high school, and at the end of fourth grade. Fourth grade is the last year of elementary school in Russia, and the end of this time is especially poignant because during the first four years of school, Russian kids have the same classmates and the same teacher. They have grown up together. They have learned how to look out for each other – even if they don’t always like each other. They have established the rules of interacting with others, for being part of a collective, that they will carry with them not just to upper school, but to university and later to the workplace. Because Russian children generally start first grade at the age of 7, by the end of fourth grade, they are mostly 11. They have changed from little girls wearing big white hair ribbons and little boys in bow ties into surly tweens. They have to be told that high-heeled sneakers are not ok for PE class. They no longer walk to school holding a parent’s hand; they send a text when they arrive. In fifth grade, they can leave the school at the end of the day on their own without waiting for an adult, and so the parents’ meeting following the ceremony involves a lecture on street safety. They still care about grades, and although none of the children who said goodbye to elementary school with my daughter had achieved the Russian equivalent of straight As, they all passed, and were spared the shame of having to repeat fourth grade. In the ceremony, they recited Pushkin, they performed skits, they promised to behave in the upper school. And because our school has a special music curriculum and all the children sing in a choir, they sang a song. 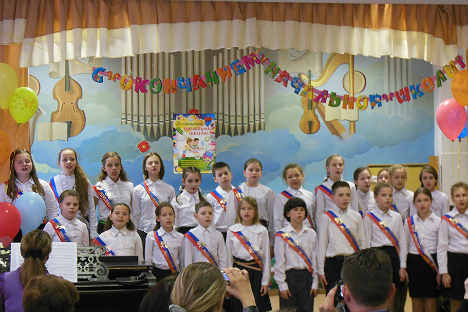 Over the past four years that had performed plenty of funny songs – the song of the frogs from the Russian equivalent of Pinocchio; a song about a lost Yeti – but on this day, they sang a song about the ephemeral quality of childhood. It was in a major key, but the words were sad. The day after the ceremony, the class had planned an outing to a kids’ club, but that day, the last day of fourth grade, was for saying goodbye, for remembering, before it was time to move on. Read more: What supplementary education options do Russian parents have for their children?